Tawana makes some awesome cookies and deserts. They also are open for breakfast lunch and dinner M-F 9-7, Saturday from 9-5 and starting Aug 4th 2013, every other Sunday for dinner at Dot’s. I really appreciate her taste in posters- it’s my mothers favorite, showing the little kid throwing the backwards over the head two handed free throw- at the net that used to eat the balls. Every other time he scored, he used to have to shake the pole. Not anymore thanks to Sweet Dot’s and David Esrati’s pledge to keep nets on rims. 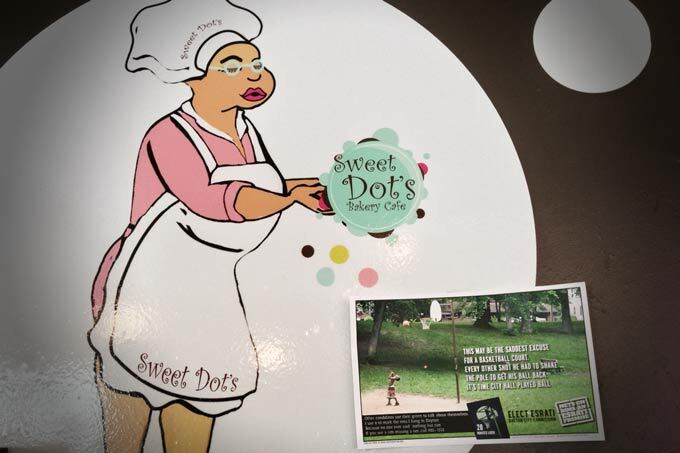 One Response to "Sweet Dot’s Cafe sponsors 3 nets"